Well folks, this is it. The final running of the Expedition Everest Challenge. I remember the first year the challenge took place, I was in Walt Disney World for our honeymoon. I tried to convince B to do it, but that idea got shot down quickly. I guess his idea of a honeymoon did not include running a 3 mile obstacle course. I was more intrigued by the scavenger hunt portion of the event, but that still had no appeal to him. Turns out it was a good thing we decided not to do it because there was a monsoon that evening. We returned from a night in the parks dodging rain storms and came across numerous soggy, miserable looking runners in the lobby of the Animal Kingdom Lodge. But enough about that, let’s get to this year’s race! 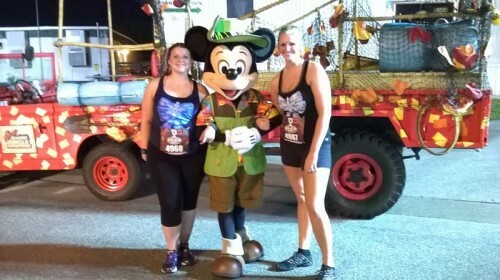 Part 5K, part obstacle course, part scavenger hunt, the Expedition Everest Challenge is one of the most unique race weekends runDisney has to offer. It is definitely more about fun and friendly competition than serious racing. All of this ends with a fun afterparty in the shadow of the mountain itself. Oh and you get some super cool medals! Participants in all of the races MUST attend packet pick-up to turn in signed waivers (click here to print your waiver) and collect race packets, which include your race bib with B-Tag timing devices, race shirt, and gEAR bag. The gEAR bag doubles at the bag to use for bag check during the race. This is also where you will receive any commemorative items you may have purchased during registration, such as pins. If you are part of a team, both team members must be together to get your packets. If not staying at a host resort, participants will need to provide their own transportation. Parking will be at the Animal Kingdom parking lot. Costumes are one of the best parts of any Disney race and this race seems to bring out some of the best! Yetis, Wilderness Explorers, you name it! 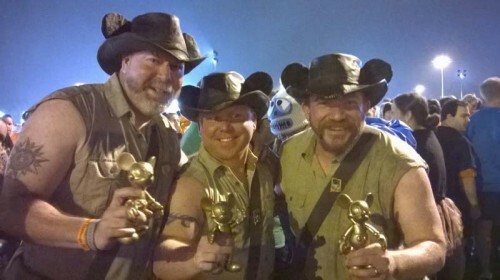 The Disney Parks Blog has some great ideas for costumes if you haven’t figured yours out yet. Please note that runners are NOT allowed to wear a face mask of any kind and will be removed from the course if this is violated. This is for your own safety, especially during a night race! So who are you dressing up as?? Participants MUST use the clear bag provided at the expo to check any belongings during the race and affix the label with their bib number on the outside. Bag check will be located in the Animal Kingdom parking lot from 8:15 pm – 1:30 am. Tip for you: Put a small, lightweight backpack or duffle bag inside your clear gEAR bag to transfer everything into after the race. The strings on the gEAR bags make them horribly uncomfortable to carry around if you are planning on staying for the after party. You must keep a minimum of 16-minutes per mile for the 5K adventure run. If you fall below this pace you will will run the risk of getting swept. Pace cyclists will be on the course to let you know if you have fallen behind. Your final time will be based on your cumulative time for the 5K adventure race and scavenger hunt. There will be 2 water stops along the course. One along the 5K adventure race and one at the start of the scavenger hunt. There is also a first aid station at the start and finish line. 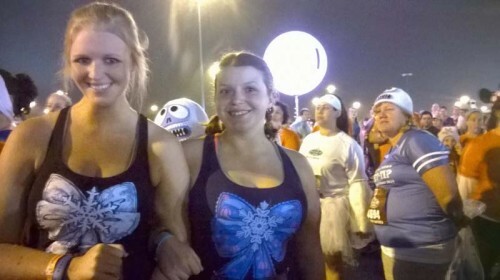 The 5K Adventure Race will begin promptly at 10:00 pm in the Butterfly parking lot at the Animal Kingdom. Runners must arrive no later than 9:00 pm. There are a few obstacles along the course that you can complete individually or as a team. The course will be closed at 11:45 pm. After completing the 5K, participants will receive their first clue for the scavenger hunt. 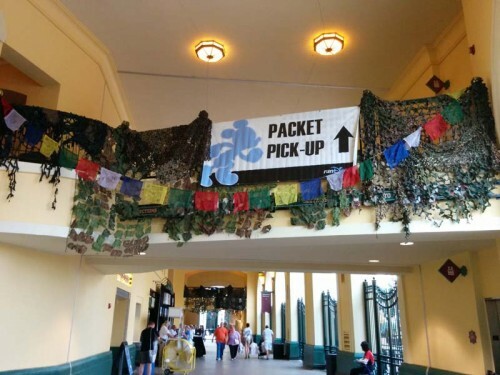 Answers to all of the clues will be found throughout Animal Kingdom. Once all clues are completed, teams and individuals must cross the finish line back in the Butterfly parking lot. The course will be closed at 1:00 am. The Post-Race Party will take place from 10:30 pm – 2:30 am in the Dinoland USA area of Animal Kingdom. Expedition Everest, Kali River Rapids and all of the attractions in Dinoland will be open during the party. Race registration includes access to the party and spectators can still purchase tickets here. Wristbands for the party must be collected at packet pick-up. 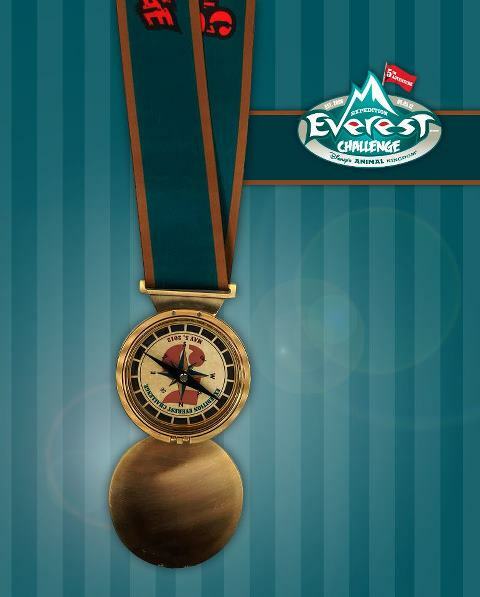 More information on the Expedition Everest Challenge is available on the runDisney website and in the Official Event Guide for the weekend. Also, check out some of my packing tips as your get ready to travel and one of my plans for prepping for night races. Lastly, check out recaps from 2014 & 2012 from some great guest writers here on RAD. If you’ll be in WDW for the Expedition Everest Challenge, head over to Starbucks at Downtown Disney’s Westside from 3:00 – 4:00 pm on Saturday, May 2nd for a fun meet-up with my friends from Kingdom Magic Runners! 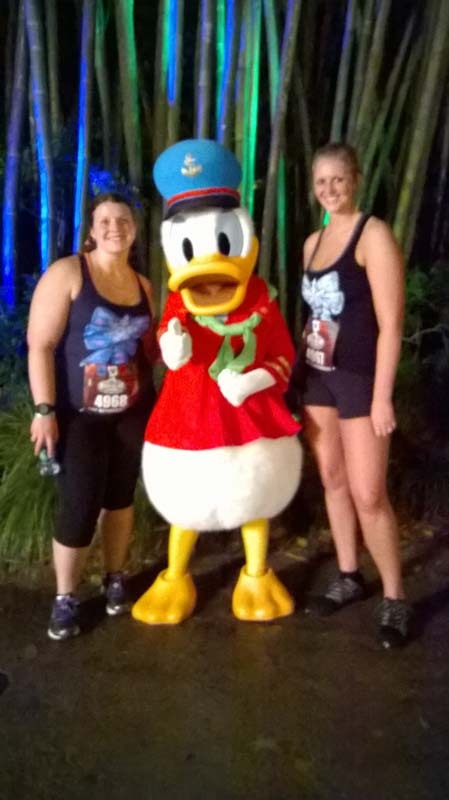 You’ll meet some fellow runDisney enthusiasts and get some fun giveaways too! Get more details and RSVP here. This is the only WDW race weekend I haven’t participated in and I’m pretty bummed that it won’t be returning. I LOVE scavenger hunts so this really is right up my alley. Sadly it’s just never worked out with my schedule. I hope you all have a wonderful time and enjoy ever moment of this unique race! If you are interested in writing about your experience, send me an email and I’ll feature you’re story here on RAD! Good luck finding the Yeti! 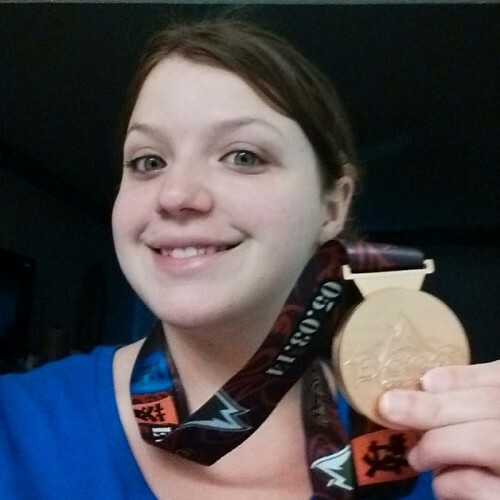 Today Sarah from Running for Inspiration is here with a really fun recap of the Expedition Everest Challenge. After reading this post and seeing all of the fun photos, I am even more disappointed that I didn’t take part in the event this year. It is definitely on my runDisney to do list for 2015! Have you ever ridden a roller coaster at 1 in the morning? Not so awesome? Rain. Especially in 60 degree weather. Especially for Floridians who have been training in 70 and 80 degree rainless weather. 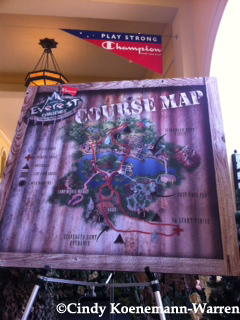 The Expedition Everest Challenge weekend kicked off on Friday with the expo which was at ESPN Wide World of Sports. Unlike the last expo I went to there (for Princess Weekend), this was all outdoors and pretty small. Packet pick up was in the inside part of the baseball stadium, as was the official merchandise (where I spent wayyyyyyy too much money). The vendors were all outside which was unfortunate since it was threatening rain. There were only 6 or 7 vendors there but I picked up a new shirt from Raw Threads, a couple of shoe charms from BeeCause, and I gazed longingly at the Garmin Forerunner 220 that I’ve been pining after for the last month. After grabbing some free yogurt (I love free food!) I headed back to my resort to beat the rain. 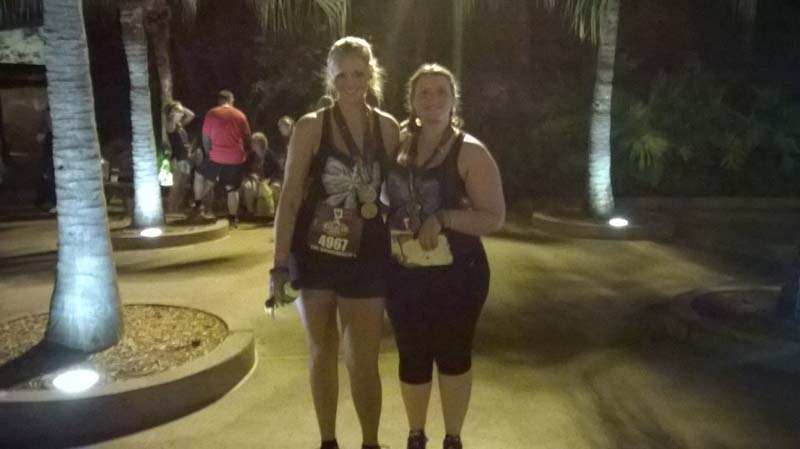 My sister-in-law Lackey and I stayed at Caribbean Beach Resort which was one of the host resorts, so the day of the race we caught the bus, and arrived at Animal Kingdom around 8:45, which left us plenty of time to go to the bathroom and get situated in our corral. We spent a good hour or so just people watching and looking at everyone’s great costumes. There were a bunch of people dressed as Elsa and Anna who committed! Full costumes! We just did the shirts and braided our hair. We also saw Robin Hood and Maid Marian along with the vultures and 3 men dressed like Indiana Jones. Which was perfect because I love Robin Hood and Lackey loves Indiana Jones. We were in Corral I, which was the second to last corral and with 6 minutes in between each wave we had to wait a loooooooooong time. Add to that the rain and then the breeze and Lackey was a very grumpy Elsa. But by the time we started running the rain had stopped and we were itching to go. The first half mile we ran with no problem and no walk breaks and we came to the first obstacle around .75 miles in which was hay bale hurdles. I jumped about 4 of them and then went around the rest. I’m not breaking an ankle on a hay bale less than a mile into the race! Lackey loved it, wanted to do it again even. I put the kibosh on that though. About a mile in we entered the park and we saw Donald Duck so I made Lackey stop for a picture because Donald is my soul mate. We looped through the park and saw people already working on the scavenger hunt. Around mile 2 we saw Mickey and then went behind Expedition Everest for the out and back portion of the race and through the second obstacle which was tires. I stepped daintily through (again, I don’t want to break an ankle) and we continued on. Once you get to the end of the road there was FIRE! and you turned around and headed back. My favorite part of the race? On the way back, we passed the tires again and a dude dressed as Iron Man said, “Obstacles! Yes!” and then tripped over the first tire. He was ok! Iron Man just forgot how to fly. Let’s blame Jarvis for that one. After that we were just on the back road behind the park until mile 3 where the final obstacle was located. You had to crawl under netting and come out the other side. Not going to lie, we skipped it. Super lame, I know. But we just wanted to cross the finish line which we could see! So we sprinted! And then began the scavenger hunt. There were 5 clues of varying difficulty. We got the first one wrong. And the second one wrong. But the rest we got right! And I might be biased because we got it wrong, but that second question was hard! You had to find letters spelled out in the previous clue and then add them together; it was weird and not what I would have thought of. But I guess that’s the point of a scavenger hunt, to make you think differently. Plus we got cool Sharpies/Flashlights so that soothed my battered pride. Back through the rest of the park, collecting and solving clues as we went and across the finish lines to get our medals! So pretty and shiny. It opens up into a compass but my compass didn’t know how to compass. I’m always going north. But I’m not planning on taking my medal through the wilderness where I might get lost so that’s ok.
Back through the park again for the party! This was my first time going to Animal Kingdom and I rode Expedition Everest for the first time and it was the Best. Roller. Coaster. EVER. Not even exaggerating. We also rode Dinosaur where I felt like I was about to be thrown from the ride and left 65 million years ago. That would have been ok with me though because I had a backup plan. I think I would find one of the herbivores to befriend and ride him around like an elephant. I’d name him Frederick, I think. After that I had to feed Lackey because she is always hungry (I think she has a tape worm or something) and then she got scared of the Yeti on stilts and we had to leave. Moral of the story: Always ride roller coasters in the dark; don’t worry if your college education let you down during a scavenger hunt because you’ll still get a medal; always have a backup plan in case you get left in the past; and if you see a Yeti on stilts, run away. 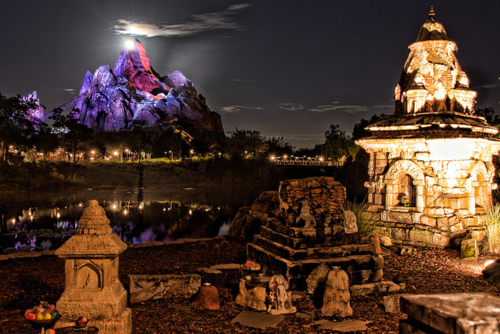 Also, if you’re able to, definitely do Expedition Everest next year. I had a blast. Sarah Simpson. Alabama born, Florida raised. Florida State University alumna (Go Noles!). Perpetrator of harebrained schemes foremost of which is running a half marathon in 6 months. Some people call me Gonzo. You can call me Gonzo the Great. No, wait, don’t do that. My ego will explode. Just call me Sarah. And read my blog. And follow me on Pinterest. You can follow me on Instagram or Twitter too but that’s not as much fun as the others. 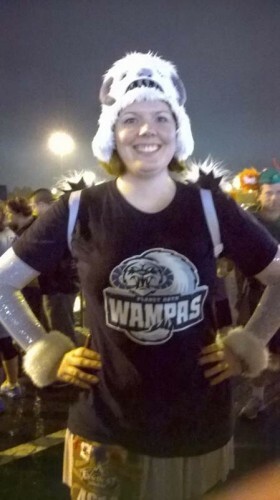 About two weeks ago I ran my first 5K. As a Disney parks fan, to me, there was no better place to run my first race then Disney. After some mild peer pressure or enabling, I convinced my friend Kristen to do it with me. It was her first 5K too. We decided to register as a team to tackle the Expedition Everest Challenge, a 5K race through Disney’s Animal Kindgom complete with an obstacle course and a scavenger hunt. After debating on a team name and figuring out our coordinating outfits, it was time to focus on training. I arrived at Disney very excited and very anxious. Aside from my concerns about an overtraining injury and the inability to run for almost a month, I was headed into a new experience, my first race and I had no idea what to expect. Kristen and I arrived the day before the race and after checking into our resort, grabbing a tasty lunch, we headed to Wide World of Sports to pick up our packets. I was not sure what to expect at registration. WWOS itself is huge! It felt like we walked a 5k to get to the registration area from the parking lot and the size of the complex did not lessen my fears. But, as I should have known with anything Disney, registration was a breeze. Aside from a little confusion over the flow of where to pick up what, we got our number, my event pin, and race shirts with ease. There was a very small booth of runDisney merchandise. I expected to be overwhelmed with vendors and shopping opportunities, but it was very low key. The entire process happened so quickly. We reached the conclusion that this particular race was much smaller in scale which may explain why it was so calm and why there were no vendors present. The day of the race came and my nerves only increased through the day. The one thing I knew was how happy I was that I decided to do this race with a friend, and that we had so many other friends around the entire weekend. Had I done this solo, both running and as a trip, it would have been very easy to feel isolated alone with my fears. Instead I felt supported and reassured that I was not in this alone. 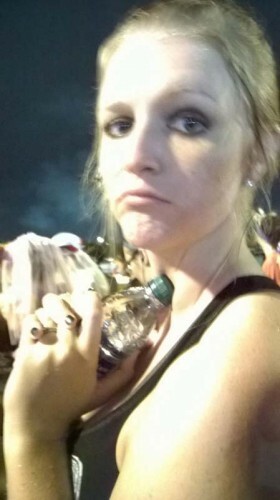 I was also really happy we decided to stay at a race resort. This allowed us to catch the bus to the race from our resort rather than having to find another way to get to the race. I am not certain we could have driven ourselves even if we wanted to and it was one less thing to worry about. Once our bus dropped us off, we made our way to the starting area. Generally speaking, the event was very organized. There were 8 waves of race starts and we were in group seven. The hardest part was finding anyone you wanted to meet up with before the race. I had a core group of friends that Kristen and I were looking for and somehow we managed to find them. I had another group of friends to find for a prerace picture and that was a bit more challenging, but we found each other. The best part of our delayed race start was that we had plenty of time to see how the start process worked and received lots of tips, reassurances, etc. from the veterans in our group. The worst part was the waiting. The nerves only continued to build. Slowly our cheerleaders were heading off to either run in earlier waves or to watch the race from designated areas for nonparticipants. And then it was just the two of us. It was a hot night, our first race, and hard to figure out what the routine should be. Because we both used the Jeff Galloway method (run/walk intervals) we did not know the best way to incorporate our warm up. How would we run our run? How bad would the obstacles be? We had way more questions than answers, but before we knew it our wave was called and the fireworks launched indicating the start of our first race. bale hurdles – I loved these!) and found our friends in the cheerleading section. We had run our first mile and we were not even in the park yet! 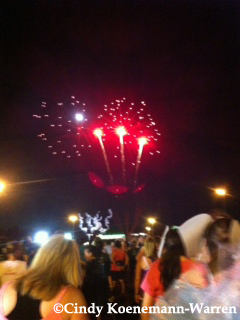 While I was anticipating far more entertainment then we got, running at night made things different. And since it was my first race, I am not sure I would have noticed anything that first mile. 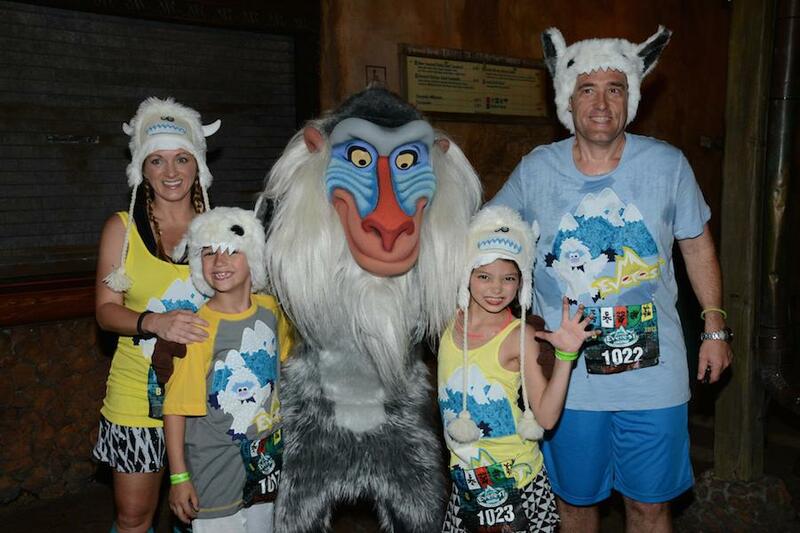 The second mile involved racing through the Oasis, up to Africa and then backstage towards Rafiki’s Planet watch. This was the first time we saw any character interaction…a puppet from the daily parade at Animal Kingdom. It was not tempting enough to stop. The only time I wish we had stopped to take a picture was when we ran past the truck holding little red which had recently been removed from the Kilimanjaro Safari experience. But other than that, we only saw characters one other time during the race. We were pretty sure that they were headed to the after race party. Maybe the obstacles were supposed to be part of the entertainment. them easily and were so excited to see the sign indicating that we had completed mile 2! Mile 3 flew by too. This part of the leg took us back through to the Oasis and then backstage. The crowd was pretty thinned out by then and it was so exciting to know we were almost there. We decided to run that last tenth of a mile and just when I thought we were approaching the finish line, we ran into the last obstacle. The dreaded cargo net crawl! I was so glad I decided to wear my capri running pants even in the 85 degree temperature because my knees were protected. I may have been one of few who survived it without scrapes! I was disappointed by the lack of finish line for the 5k. I did not know enough to connect the timer on the side of the route as a finish line. 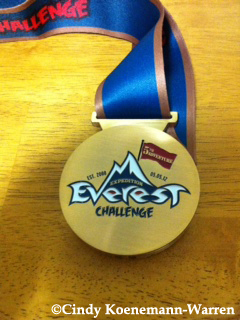 This was a result of the actual finish line being located outside Everest at the end of the scavenger hunt. We realized we were done the 5k when they handed us our first clue for the hunt. Because we reached out goal of running our 5k, we may have taken our time with the scavenger hunt. We finished it pretty quickly but we did not run. Crossing the finish at the end of the hunt was a bit anticlimatic as we more wandered across the finish line than raced across it. Getting my first medal made the whole experience did make it feel a bit more special. I have definitely been bit by the running bug. 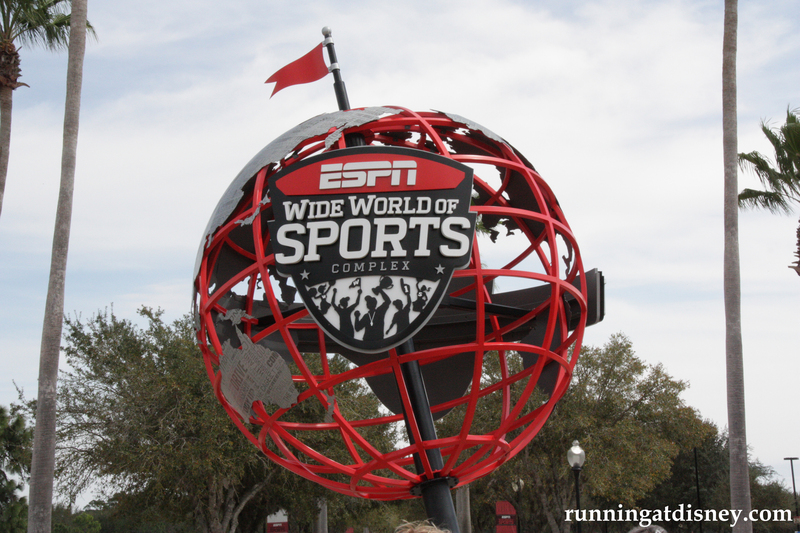 I have already registered for another 5k, a ten miler and a half, all at Disney this fall. As much fun as I had, I am not sure if I would recommend this race for a first 5k only because of the lack of fanfare at the finish of the race. That said, I would highly recommend a Disney race for a first experience and would also strongly recommend running with a partner. 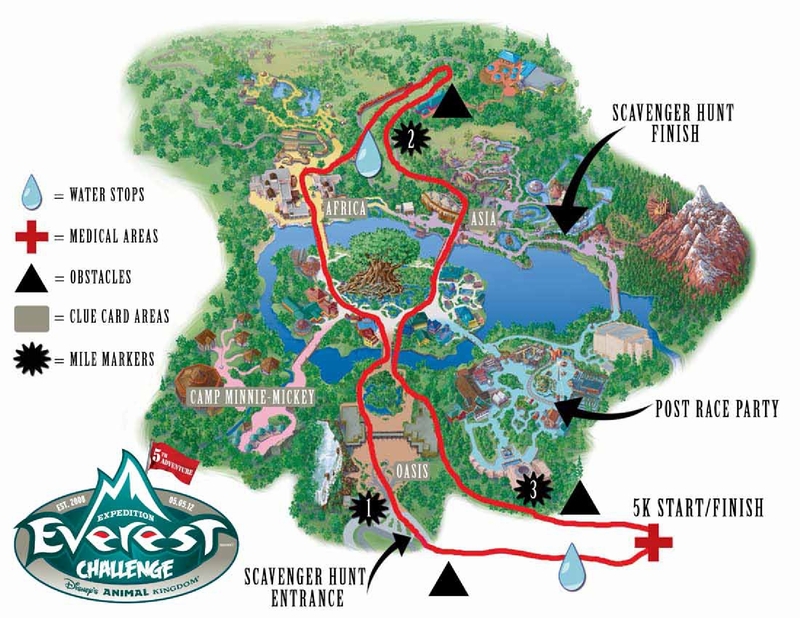 Tonight is the Expedition Everest Challenge! This is a race like no other at Walt Disney World. One that I have yet to run and can’t wait to experience one day! This is a unique experience as it combines a 5K with obstacles and a scavenger hunt. Who doesn’t love a good scavenger hunt?! Oh wait…I’m having flashbacks to the sweatfest otherwise know as the Destination D Scavenger Hunt of 2011. No one loved that event. 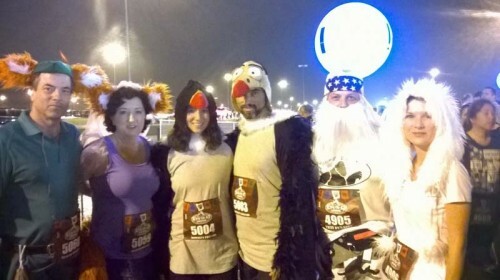 Anyways, this race is a night race which gives a very unique perspective on Animal Kingdom. The park isn’t open at night very often and is something I’ve always wanted to see. 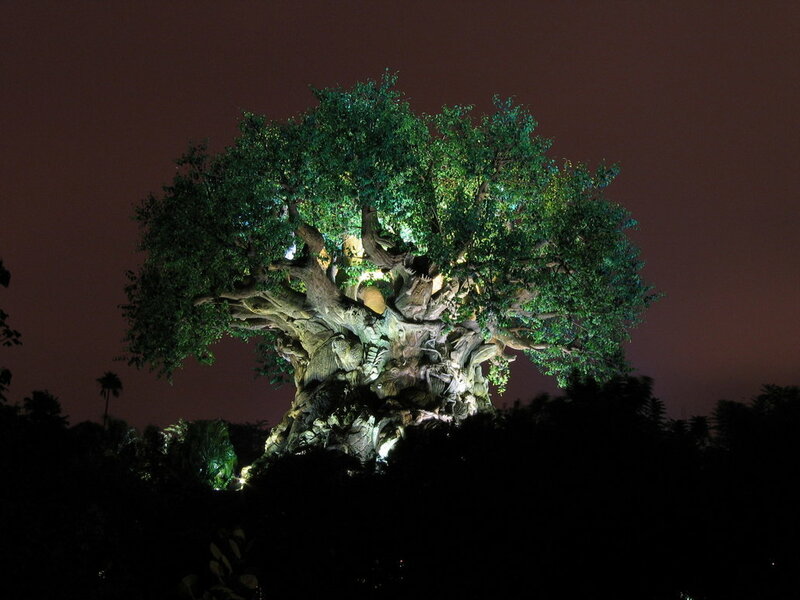 Tree of Life at night…Gorgeous! What makes this race different from a normal 5k is that it incorporates obstacles along the way. Prior years have included hay bale hurdles, a tire run and a rope climb. They aren’t too difficult as this is a family event, but just give a little extra challenge. One of the coolest aspects of this race are the medals. I think this is probably the best race medal I’ve ever seen and spectacular for a 5K. It’s an actual compass!! 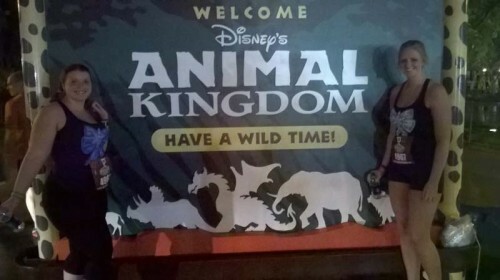 After the race and the scavenger hunt, Animal Kingdom stays open until 1:00 am for a post-race party! Family and friends can celebrate with the racers and experience favorite attractions. Dinosaur, Kali River Rapids (to wash off the sweat) and of course Expedition Everest will all be open. Only Disney could provide such a fun and unique race experience. 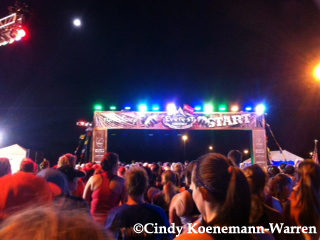 For a great recap of last year’s race, check out my friend Amanda’s experience. 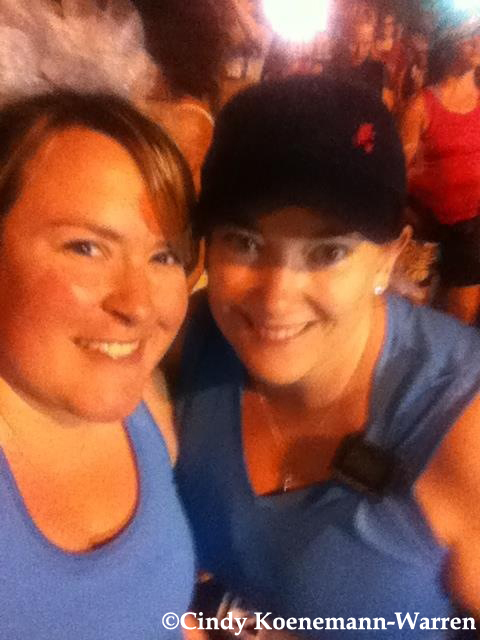 Good luck to all the racers tonight, especially my friends Cindy and Kristen who are running their first 5K! Hopefully I’ll be able to join you next year. Oh and beware of the Yeti!